This is a fun community event, welcoming all people to celebrate mixed heritage. The family fun includes live music and dance by Zhambai Trio and the Kauhane School of Polynesian Dance, balloon art by author Michael Ouchi, henna creations by Jasmine, facepainting and a photo-booth. Zhambai Trio plays traditional and original music from Zimbabwe and features ancient instruments such as the mbira (“thumb piano”), hosho (maracas), and ngoma (hand drums) as well as the more contemporary Zimbabwean marimba. The haunting yet uplifting sound of the mbira rhythms and interlocking melodies combined with the lilting quality of the vocal harmonies are at once stimulating and relaxing. The sound is reminiscent of water dropping, spirits talking, ancestors singing and blood pumping. Listen with open ears and you'll find time becomes elastic as you get lost in this magical music. 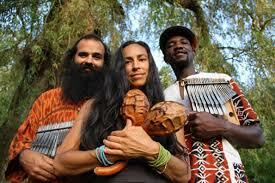 As a trio, these multi-faceted musicians bring a message of joy and healing to themselves and the listener. Jasmine Cambon is a designer, illustrator and painter from Vancouver, British Columbia. She is currently attending Emily Carr University of Art and Design for communication design and is employed as an apprentice at Brandever. Since its inception in 1999, Halau Hula Ka'Uhane O Ka Pakipika has grown to nearly 150 haumana (students), ranging in age from 2.5 years to 70+, and is the largest Polynesian dance school in Canada. The school is the proud recipient of the Top Polynesian Group award from the Pacific West Performing Arts Festival for many years. The school performs regularly throughout the year at private and commercial venues and travels and learns throughout Canada and the US, including Hawaii.